Andrew was 13 when he first presented to our office. 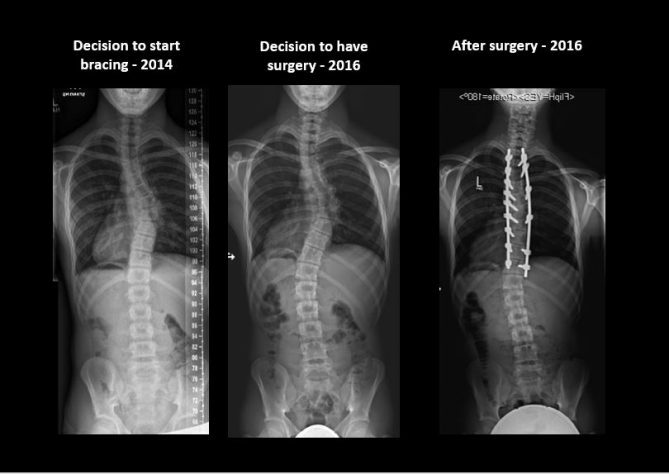 He has a positive family history of scoliosis with his older brother having a spinal fusion. I had a discussion with Andrew and his parents about non operative treatment of scoliosis. I recommended both bracing and Schroth physical therapy. He started this right away. We discussed various brace options and he and his family opted for a Rigo-Cheneau brace. Andrew was a super star with the bracing and Schroth and was very compliant. He even wrote a speech for his middle school graduation about his experience. He had several visits with our orthotist John Tunney to optimize curve correction. Unfortunately, Andrew’s curve did continue to progress during his rapid growth phase despite bracing and Schroth. Bracing decreases chance of progression to a surgical curve by about 50% but it can still progress. As he approached skeletal maturity, Andrew’s curves measured 35, 50, and 30 degrees on x-ray. After five years of bracing and schroth, Andrew and his family decided to move forward with surgery. 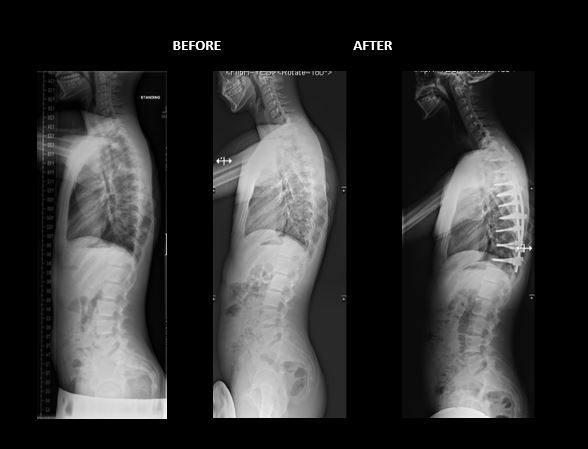 Based on his curve size, location, and flexibility, we moved forward with a selective thoracic posterior spinal fusion. At the one year anniversary of his surgery, review of his x-rays shows a near-complete correction of his curve. I am thrilled about how Andrew has done. Andrew has returned to full physical activity and is going to have a very active summer away in Patagonia.